The strongest impression one walks away with from The Grand Opening of Walt Disney World television special - broadcast 10/29/71 - is not necessarily of the size, scope and invention of the new property, nor of what Disney probably intended you to take away (based on the number of celebrities accumulated for the special), which is to say its' status as "The Entertainment Spectacular of the Century" (Look Magazine's phrase which Disney aggressively pushed in its' first few years). Thirty five years later we appreciate the changes in the buildings and landscape, but this is hardly what the special is intended to impress upon us. Namely, what is amazing is Disney's sell of Walt Disney World to us as a place for adults to escape day to day reality, with children a secondary concern. Sure, there may be a Fantasyland with a Dumbo attraction, but look who's riding it - Glen Campbell, Julie Andrews, Jonathan Winters, Bob Hope. The show is not structured in such a way to be specifically entertaining to children - in stark contrast to the chaos of Dateline: Disneyland, it is an entertainment spectacular steeped in a funky 70's aesthetic, with scarlet polyester clad choreographed dancers zipping through a fetal Magic Kingdom chanting "It's the greatest show on earth!" It has the strangest opening of any of the Disney promotional films: as the camera zooms in tighter and tighter on a sunrise, we hear the ghostly disembodied voice of Glen Campbell as he marches through the central Floridian wilderness, guitar slung over his back, singing a typical country song of his style. This proceeds uninterrupted, without comment, for over three minutes until, finally, dramatically, he walks under a monorail beam. And viewers would be forgiven for thinking they were watching an A&E Movie of the Week up to that point. Campbell's contribution to the program is the most charming as well as often the most unintentionally hilarious, as when he, sitting and playing guitar on the Liberty Square riverboat landing looks, with the help of the telephoto lens (which artificially flattens space as it zooms), as if the Riverboat is about the plow into him in a catastrophic apocalypse of polyester. He also makes some pretty eyebrow-raising comments like "You know sometimes I think we think Freedom is our right - so we can do with it what we like." We shouldn't hold Glen at fault - it's a strange shooting script, but standing in Liberty Square and having been just avoided death at the hands of a Riverboat, it inevitably causes modern audiences to twitch. Julie Andrews arrives to do nothing, as does Bob Hope, who dedicates the Contemporary and blows his best joke almost immediately, which is about the Goodyear Blimp and which I won't ruin here. If you've ever wanted to suffer through the spectacle of Buddy Hackett driving Herbie down the Grand Prix Raceway, this is the place. Or how about unfunny skits with Jonathan Winters at Fort Wilderness? Got that here, to. Besides all of the musical numbers and celebrities and nonsense, what does come through is Disney's sell of "not Disneyland" - not only is the legacy of Disneyland not once invoked, but the elements that are heavily accented with standalone segments are those which are unique to the Florida property - Country Bear Jamboree, Hall of Presidents and Mickey Mouse Revue. Nowhere mentioned is the expanded and much improved Jungle Cruise, the revised Flight to the Moon, or the company's then-current "Blockbuster Franchise", The Haunted Mansion. Nowhere mentioned is the Western River Expedition, Space Mountain, or E.P.C.O.T. What we do see is resorts, campgrounds, lakes, monorails - and very little of the park. Although musical numbers like "There's More!" accent the park, the images are shot and framed in such a way to restrict any sense of geography, freeing up the facades to become pure spectacle. Compared to the structured introduction of Disneyland's vital components in Dateline: Disneyland, The Grand Opening of Walt Disney World presents the park as little more than an abstraction of glee. And above it all, Disney is shouting "It's not Disneyland! It's new! Improved! For adults! And Not Disneyland!" And true, as they claim, Walt Disney World, for all of its' faults, is not Disneyland. At Disneyland there was not a Top of the World. At Disneyland there was not a Chinese junk which was also a floating cocktail lounge. There was nothing at Disneyland to match the beauty, charm and elegance of the Electrical Water Pageant until the Disneyland Hotel purchased and installed the Dancing Waters show. For simple romance, Walt Disney World Phase One has never been matched as an attraction for the entire family - and mostly adults. Eisner's reign would add many more hotels, some designed as an intellectual exercise in "whimsy" (for adults) or vaugley themed blocks of hotel rooms (for kids), but its' important to note that Walt Disney World's two biggest expansions B.E. (Before Eisner) were the Shopping Village in 1975 and EPCOT Center in 1982. The Shopping Village was billed and remained until the 90's an adult's attraction full of shops children were unlikely to take interest in. And EPCOT Center was designed from a very adult point of view, intended to educate and entertain on "big issues". Yet all of this is in the future, and watching The Grand Opening of Walt Disney World, which is fascinating and mostly watchable, is both a happy and sad occasion. Happy, because it shows that Walt Disney World didn't "all start with a mouse" - it was discovered, Columbus-like, by Glen Campbell. Sad, because dangling before us is E.P.C.O.T., Western River Expedition, The Asian, The Venetian, and untold wonders from when the Orlando property promised to be so much more than it ended up being. Today, looking back at Disney history when it actually involved Disney, today it seems like July 17, 1955 is the epicenter of the Disney empire: everything that Disney had been building towards and much of what he would spend the rest of his life perfecting. After Lady & the Tramp Disney animated films make a precipitous drop in quality - Walt's new toys being three-dimensional, not two dimensional - and for better or worse the QC function went into the hands of the animators: the rigid but gorgeous Sleeping Beauty being the domain of Eyvind Earle, Jungle Book having all of the irritating touches of Woolie Reitherman, and 101 Dalmatians feeling very Marc Davis in pace and design. In terms of inventing a new art form Disneyland is at least on the level of Snow White, and stood to be as much of a colossal failure. Unlike today's Disney empire, Disney built his business on taking of succession of risks and gambles, small and large, successful and not. He rolled the dice twice on Disneyland, not only on the park, but on the new television medium. And Disneyland itself was built of, on, and with a foundation of cathode ray tubes. 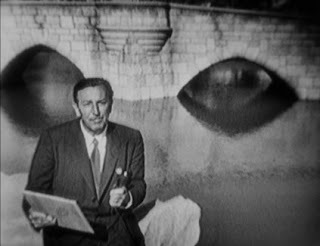 Although critics of Walt Disney often point to his status as essentially a talented manager, an animator who couldn't even draw his own star characters and later in life as a right-wing mogul who built a crazy utopia in the middle of nowhere, they often overlook his brilliance in introducing new ideas and concepts. And the fact that Americans always followed his crazy gambles. It is a masterstroke to introduce all of the key concepts of Disneyland in the format of a television revue show for the entire family. Where a market existed, for the animated features or the True-Life Adventures, it was exploited. Where a market was needed, it was created, and he created stars out of Fess Parker and a schoolroom full of clean-cut American youth. And most importantly, he made a star out of himself and his park, usurping his early career's image as a volatile and aggressive boy wonder and shaping it into a homely protector you could treat to dinner. Look at his official portraits from 1934 and 1955 and the differences in lighting, accent, and pose - and their intent - is unmistakable. Yet as he created in American families an innate understanding of the concepts of, and a familiarity with, Disneyland, he saved one of his most brilliant flourishes for the whole gamble, the opening day. 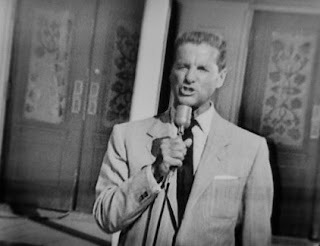 By inviting journalists like Art Linkletter, already a respected force in the television scene, Ronald Regan, who was best known at that time for croaking "Win one for the Gipper!" in the phenomenally successful and nauseatingly didactic film Knute Rockne: All American, Disney was shaping his park's public image into something very particular. Already having sold the concept of the park, he now only had to sell the fact that it was open. Rather than being a travelogue designed to introduce the park, an entertainment spectacular intended to sell its' glamor, Disney was building for Disneyland a movie premiere. The opening dedication of Disneyland, read by Disney, cements in place a number of diverse concepts floated through the park, and the Disneyland show, with the conceptual 'mortar' of the speech being that the park is somehow about America. Although certain areas most certainly are - Tomorrowland is an enormous swan-song to American industry in 1955, Frontierland its' Manifest Destiny - it's rather hard to pass Adventureland and Fantasyland off as being somehow indicative of this concept. Disney apparently saw no need to stick to his guns on this thesis statement either, else a Swiss mountain wouldn't have been built in Tomorrowland. Rather his sentimental, distracting and obtuse evocation of Disneyland as "The American Exposition of 1955" is a smokescreen which reassures the viewers, us, the television audience, that Disneyland is Safe, Friendly, and Clean Cut - things that amusement parks in 1955 were not. 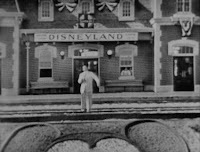 Although later park-centric Disneyland programs are usually based on the entertainment value and pagentry of the venture, with parades and endless Annette Funicello musical numbers, Dateline: Disneyland looks exactly like what it is: a live televised news program with all the guts hanging out. Dateline: Disneyland is thankfully preserved to capture the birth of an American cultural zeitgeist on its' first public exposure in all of its' insanity. Disney looks frequently distracted and terrified. The park looks barren, half-finished and mobbed. Linkletter often appears to be the unflappable ringmaster of a circus. Sammy Davis Jr. rams Frank Sinatra on the Autotopia. Madness breaks out in front of Mr. Toad. Adventureland is almost totally forgotten. Onscreen hootchie-coochie is accidentally broadcast live. If only cameras had captured the fabled James Mason fistfight in front of the carousel, it'd be impossible to conjure up a more successful image of a slightly controlled riot. Disney had much to lose with Disneyland, and even more soberingly, all through 1954 and 1955: having costily converted Lady & the Tramp to widescreen, reshot the ending of 20,000 Leagues Under the Sea, and built Disneyland in less than a year, the Disney studio couldn't afford for any of those ventures to misfire. Had even one not been successful there simply wouldn't have continued to be a Walt Disney Studio. Disney laid his neck on the line once again and many people were disappointed when he did not fail. He didn't even merely succeed. He created three of the most lasting cultural institutions in America. For the first time Americans looked up a quaint American street to see a European castle. Although the image is irrational and, to some, the worst kind of cultural colonialism, to Americans it always will and probably always has made sense: here, Walt Disney had built the American Dream in concrete, plaster, and wood. Watching it happen on screen for the first time some 50 years later is chilling and exciting. Dateline: Disneyland is a fascinating and sometimes brutally honest look at Walt Disney's greatest gamble. Her name was Devilish Mary! Ye-haw! 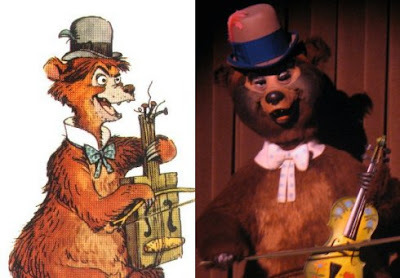 The above song, written by songwriter Bradley Kincaid and performed by robotic bear Zeke in Walt Disney World's Country Bear Jamboree, has been performed nearly every day for over 35 years now. But something has changed, which would be the recording itself. For the first four years of the Magic Kingdom's operation, guests were treated to a recording by master voice actor Dallas McKennon as Zeke. This is most emphatically not the recording heard today. According to the Disney Archives, and since they were in operation at this time there's no reason to dispute this, the recording was changed in 1975 for reasons unknown to a lesser version sung by Randy Sparks. The difference hardly needs comment. What Disney was after here is honestly beyond me, as the McKennon version is infinitely funnier, more nuanced, and importantly not annoying. The voice doesn't seem appropriate either: Zeke is a graying, bespectacled old-timer character who would probably not be especially interested in barking out a song like he's trying to get you to wake up. Sparks' version loses a lot of steam at the very end: the song comes at the crucial moment in the attraction where things are starting to speed up, McKennon's "Yea-Haw!" just moments before the baby bear's concluding honk-honk has the telltale fingerprints of Davis, Bertino and Bruns' crackerjack timing. The timing of this change is strange also: in 1975, Disney wasn't preparing to do anything in particular with the Bear Band show; as the opening of the Disneyland version was in the past by three years and the Tokyo version at least seven years away. Although the Disneyland version did have some significant revisions to character branding, appearance and animation, three years later does not seem an opportune time to do anything to the popular revue show. There exists some evidence that Marc Davis did do some further work on the attraction at some point, weather this be in 1975 or not is questionable. I said I can't, I'm a married man! If ya can't bite, don't growl! Fiddler Ernest's version of Tommy Collins' 1965 song was also re-recorded to significantly less detrimental effect by Sparks at the same time. The new version has a much more exciting opening more in line with Ernest's character, although the Van Stoneman version can boast a much more charming and interesting delivery. In this case, what the purpose of the re-recording is actually clear: Sparks books through the song with significantly more zest than Stoneman. Call me a complainer, but I think that at least the McKennon version should be restored to the show. Anybody know why it was removed to begin with? In response to my previous post, "Dialectical Montage and Disneyland", I was lucky enough to receive this reply by a Mr. Chris Stangl, who does an excellent job pointing out a lot of the problems with my assumptions about physical space and cinema space in the essay, as well as bringing up a number of excellent points about film theory and applicability. Since there's little point in me recounting such an articulate and intelligent argument, I have presented his reply below for your consideration, followed by my own thoughts. "I think this essay is a solid start toward understanding how park and attraction design incorporates elements of the other arts. However, any thesis that rests on "the only useful, acceptable way to analyze and discuss" a subject is going to be problematic, and practically begs for complication! It's a pretty grand Unified Field Theory of Imagineering, for one thing, and using Eisensteinian montage as even a starting point is going to lead to trouble. It is a specific editing theory, which hasn't been borne out in pure form outside of, say, the films of Sergei Eisenstein. "Dialectical" does not just mean the editing theory explains "nothing more nor less than how movies carry meaning through their editing patterns" as in language. It means the theory is modeled after philosophical dialectics, and it is founded in the contradiction synthesis and material/brain-world interaction of Marxist dialectics The theory in practice involves shots as discreet units in conflict, generating an effect not present in isolated consideration of the shots; it is "shot-based", in a literal, diagrammatic way. so the first question must be: is there even a way in which a park may have discreet shots, which are replaced by another? Dialectical montage is an indigenous film theory, extremely and expressly medium-specific. The elements you are identifying as the attraction equivalent of "shots" could possibly be linked to notions of cinematic mise en scène, but what differentiates the set dressing and view-isolation you've identified as fundamentally different from the art of interior decoration, or theatrical stage craft? Eisenstein's montage theory is, I've proposed (and in "Dialectic Approach to Film Form" he would almost certainly agree) not applicable to any medium but film; shifting definitions so that park design is film is kind of a slippery sidestep of the central problem. The second problem is that Soviet montage is not the editing mode of Disney films. Eisenstien indeed loved Disney animation, and incorporated iconography and technique from Disney's films. But all this demonstrates is that Snow White impressed Eisenstein. From the Laugh-o-Grams to Meet the Robinsons, Disney films follow the same continuity editing patterns as all classical Hollywood cinema. That attractions (and even more so park architecture and broader theming) cannot be broken into proper discreet shot units for juxtaposition should be self evident; but perhaps the ride-through attraction could be considered a three-dimensional version of a Bazin long take, the panoramic views his ideal of deep focus and wide shots? Could we even honestly link this idea with Disney's films, since they are not founded in this theory, either? Eisenstein's theory is anything but "seamless montage", so isn't the Omnimover a theater seat designed to eliminate this "intrusive" technique? The narrative of The Haunted Mansion is that we enter an old house, and are immediately witness to non-corporeal manifestations of supernatural activity. We participate in/ observe an ill-advised seance with Madame Leota, who summons ghosts to a jamboree. We pass through the ballroom and see guests arriving in physical form, and the party gets bigger and bigger until we pass through the no-mortals-allowed area of the graveyard. Finally we become as close to Mansion residents as we may in the mortal coil, and a ghost follows us home. That plot is vague and abstractly conveyed, but it is three acts, it is conflict, climax and resolution, it is the loose structure that ties the attraction together, even beyond simply passing through an architectural space. Granted, dozens of proposed plots which were far more specific were rejected for the ride. Imagineer-God Marc Davis may insist rides are not a natural storytelling medium, but there is not a single attraction that doesn't follow a general plot arc in practice. Even Big Thunder Mountain, and Winnie the Pooh tell a story; the exceptions are those modeled on thrill rides (Gadget's Go-Coaster, Dumbo, or most of California Adventure). What is differentiates Pirates or Snow White from their true antecedents, carnival horror-house dark rides? Or are those spook houses to be understood as 3D montage as well? How do we account for the fact that this lineage stretches back far beyond the birth of motion pictures? All film theory is founded in tensions of the complicated relationship between the real and its representation in motion picture photography. Any park theory that is going to apply film theory is going to have to account for the fact it is not dealing with film." The real problem with applying film form to park form is not only that film form is expressly filmic and rarely relatable to even similar forms, but in a theme park there simply isn't even a film frame in which to construct a mise en scene, much less allow for editing patterns. Since the frame is the ultimate boundary of cinematic space (regardless how interesting and effective films like "Line Describing A Cone" are in expanding this), how can a theme park even be considered a cinematic conceptual extension when it doesn't even utilize the material of film? I argue from two standpoints: intent and effect. Sadly in theory of any kind "intent" and "effect" can't always coexist happily with "theory" - this is why concepts like "camp" become the inevitable apparatus for assigning value to objects even their creator may not have intended - but as a mostly logical extrapolation, I think it's fair to apply film concepts to park concepts. In design and effect Disneyland most resembles a film set rather than, say, a sculpture, a theatrical production, or any of the other three dimensional art units we are expected to interact with. Just like a film set, all of the possible angles are covered, because the "camera" is you, "unchained" to an extent even Fruend couldn't have dreamed of. This is clear intent, backed up by the intersection of popular media and park space over and over again in Walt's Disneyland of 1955: Main Street USA as the unofficial home of Lady & the Tramp, Tomorrowland as a kind of three dimensional extension of Ward Kimball's television shows. Although only Adventureland actually came close to being called "True Life Adventureland", it's kind of amazing that Frontierland never just up and came out as "Davy Crockett Land". All around us, even in those early days, Disney was both backing up its investment and making us comfortable by exploiting better known properties to forge a link between Disney Media and Disneyland. So I think at least in crude conceptual terms, the link has always been there and is a logical first step (not only step) towards getting to the meat of the issue. Now, effect. Although I won't argue that there is no film material or even film frame in the essential makeup of Disneyland, I think it's possible to argue that, in effect, there is something analogous to a film frame in mature park design. In order to expand on this, I need to go back to Chris' comments. 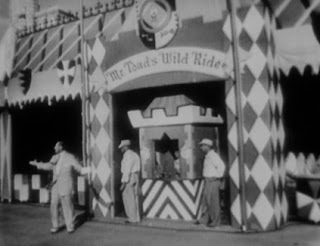 "That attractions (and even more so park architecture and broader theming) cannot be broken into proper discreet shot units for juxtaposition should be self evident; but perhaps the ride-through attraction could be considered a three-dimensional version of a Bazin long take, the panoramic views his ideal of deep focus and wide shots?" I'm glad that Bazin has been brought up here, as I also considered his concepts as to what ought to constitute filmic reality in relationship to parks carefully. Although it is true that the human eye can see in a panorama essentially similar to the 2.35:1 anamorphic film frame and in any depth it desires, regardless of where the omnimover is rotated, much park design seeks to "guide" the gaze of the viewer in ways subtle and not so much. Through placement, lighting, and finish, the viewer can be persuaded to look at one item and not another, although all of the objects in the room are lit. In the Orlando Haunted Mansion's music room, the desolate landscape outside the Mansion is represented by three moss draped trees in front of a flat black wall. Although the landscape is there for you should you desire to look at it, most guests do not because they're busy looking at the centrally placed and more highly accented piano. Things Disney doesn't want you to see it simply paints grey, green, or black, and generally you don't see these things. This 'forced selective vision' is, in effect, somewhat similar to the camera's manipulation of depth of focus or the film frame's ability to include or exclude. Furthermore, regardless of how smooth the vehicle is engineered to run, it is possible to argue for an effect similar to cutting not even based on the structure of the rooms and manipulation of the gaze, but on the essential makeup of humans. I believe it was Stan Brakhage (jeez, I'm really hanging my formal biases out to dry here) who argued that a camera pan in film, contrary to Bazin, was unnatural because the human eye simply didn't operate that way. He argued, and I agree with him, that if an individual attempts to replicate a pan with either their eyes or turning their head, they will find that the human eye simply does not smoothly move to the left or right, but jumps from object to object highly irregularly. An omnimover, boat, or whatever else, while in intent may replicate a forced pan, in effect, to this author, most resembles a succession of impressions - "shots" - which, through the manipulation of gaze, roughly attains an effect similar to an edited sequence. This doesn't mean that parks are films or that any other medium is an invalid way of engaging this fledgling art, yet this is my conceptual groundwork towards making the statements I have. First of all, I must compliment Chris Stangl on his excellent capsule overview of Eisenstein's theories of montage, which is more concise and articulate than I could have done, as well as more accessible, which is one reason I shied away from really delving into the theory, settling instead for a summation of it as it is applicable to the broader world of film, not just Eisenstein. It's true that dialectical montage via Eisenstein hasn't really ever been practiced in pure form outside of his films, although I would argue for similarities between Eisensteinian montage; Kurosawa's manipulation of space, depth and time; Antonioni's tone poems; and Lang's sound-image matches. They're just fragmentary, but they exist. There simply isn't too much of a market for stone lions rising in anger during battles in say, Beyond Borders. I would, however, argue that Eisenstein's theories are applicable to Hollywood films not called The Untouchables. His theories opened the door towards utilizing cutting in an expressive way in traditional narrative films as well: the most obvious but still salient example is Hitchcock. I've seen something very close to dialectical montage United Artists' Hallelujah I'm a Bum!, with Al Jolson, from 1933. It needn't be hyperactive, abstract cutting between static shots, as in Eisenstein, but any kind of expressive cutting which juxtaposes ideas through context, not content. Eisenstein is the poster child for a whole separate idea of dramatic presentation which arguably has existed since Griffith. And that, then, is why I think we can reasonably argue for the inclusion of Eisenstein, Bazin, and whoever else comes down the pike into the list of influences evident in cinema, Disney included. Disney and all narrative films are part of a tradition which I think can be referred to as an Institutionalized Mode of Discourse, a very particular identifiable pattern through which humans tend to express themselves, from lunatic asylum productions through Shakespeare and Japan's Noh theater. It's arguable that although cinema is the inevitable final result of the invention of the motion picture camera, it could just as well have developed along the lines which the Lumerie brothers originally used it, rather than turning towards the Melies mode of narrative discourse, and ended up being a medical device or something. It didn't, and in fact the narrative cinema developed which transcends languages, because it simply is able to plug directly into this institutionalized narrative mode. Had motion pictures been invented in the Civil War, we probably still would have ended up making moves the same way. This is why those old carnival spookhouses are almost certainly 3D montage, and how they could have existed before there was even a material strip of film to cut into a montage! Disney product could, after all, be rather outrageous, especially when Uncle Walt's back was turned, while still remaining true to the narrative form. The classical narrative form is also the mode of Eisenstein's films - certainly propaganda, possibly avant-garde, but ultimatley narrative. That his films were less organized around a three act structure and more around movements, as in music, is beside the point, although even the very essence of the Silly Symphonies is based on this same idea. Eisenstein and Bazin worked from inside an already mature art, not outside. Theories rarely shape films; they merely explicate the inevitable. It's unfortunate, but certainly true. It's also unfortunately true that not all theories used in filmmaking by filmmakers are translatable to a park environment. I spent about a week contemplating the possibilities of using Brechtian distanciation in a theme park. What possibilities! In what attraction were you repeatedly and intentionally made conscious of the fact that you're on a theme park attraction, thus made not to care about the events taking place? Could Stitch's Great Escape be the first example of distanciation in a Disney park? What about those transitional curtains in Horizons? Symbiosis? Or even the Haunted Mansion? Is that why everyone remembers the Hitch-hiking ghosts - because they've broken your distanciated bubble? Ultimatley, I had to conclude that if any attraction did use distanciation, it was either a stupid miscalculation, it just wasn't a very good ride, or I was grasping at straws. I had to totally reconsider. This is how my concept of "Presentationalism" came to be. It also must be said that we'll also never be able to fully comprehend the extent of the art of the theme show, because of its' nature of time, money, and audience expectation. There will never be an experimental theme park attraction which uses distanciation, disjunction, or an equivalent of the "Open Frame", because they are made for an audience in a restricted time frame with a certain cash outlay. Country Bear Jamboree would undoubtedly have been improved had Marc Davis been given endless time to sit in a room and play with the timing of the curtains opening and closing, but this is not realistic, never mind desirable! "Franchise" attractions may be rethought, retooled, and sometimes improved as time passes, but these are mere rungs on a ladder which stretches endlessly into the void. Despite my claim that the art was "mature" by the opening of Pirates of the Caribbean, arguably it is still in a state similar to the very early days of film - before Lang, before Griffith, possibly before even Porter. Could it be that we oughtn't to be thinking of Disneyland as an extension of films like Casablanca and more like a lineage that flowers outward from This is Cinerama, or William Castle's gimmick schlock-fests? The problem with distanciation is that if the audience is made to not care about the theme park attraction they're on, then the attraction has utterly abandoned its' purpose for existence - to provide entertainment more immersive than film can. Applying film theories to Disney rides is most dangerous here - intent and effect must, as always, be in as harmonious a balance as possible. Although the intent of the Haunted Mansion is a clear rising plot arc, its effect is accidental, incidental, fragmented, but it has gained immortality because of that effect. Theories must be kept in check, because they explicate the art, but do not replace it. All of these are but shots in the dark towards a target we can't even see yet: stepping-stones towards the seed of a workable concept in evaluating the value of the theme show. Once an artistic stance can be taken, others can follow, for or against. Right now there's nothing. As a film maker who values form very highly, it's not surprising for this author to fall back on Eisenstein's theories, but the opinions of stage directors, of the Bazin faithful, of naturalists, of minimalists, of graphic designers must be heard as well. Film cameras and film stock, while not easily available, were and are still accessible to almost everybody, enough so that anything than can be done in film probably has. Very little of what can be done in a theme park has been done as the creation rests not in the private artist but the public corporation, so essays like this must always chase after a receding vanishing point, begging credibility. Yet it is crucial that essays like this still ask the question and ask the reader to answer: where do you find value in the theme show? And, finally, some semiotics: how do we know this? Chris Stangl operates The Exploding Kinetoscope, an enviable blog which has more insightful film commentary than you're likely to find here and is, unlike this blog, actually funny. There's also Permanent Monday, which analyzes "Garfield" from various angles and is also, unlike this blog, actually funny.